The Deadline is January 6. 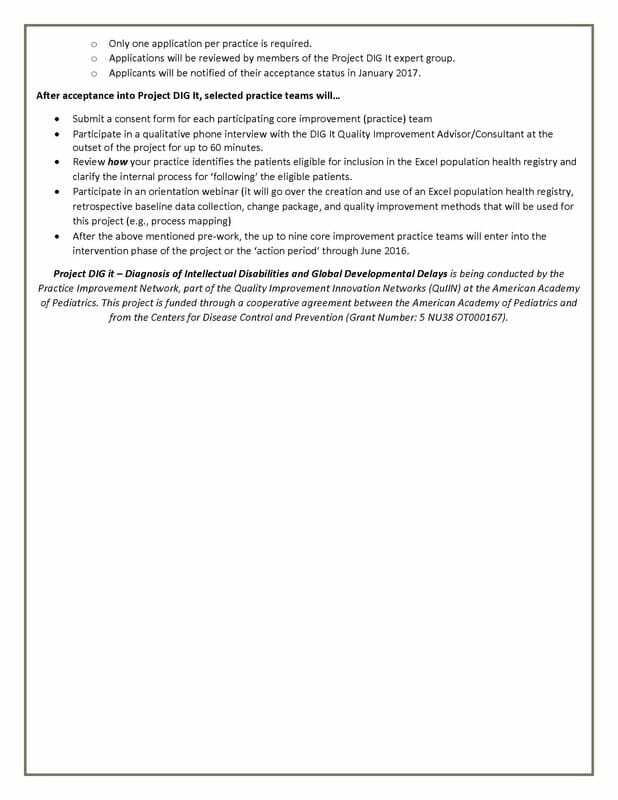 Via a cooperative agreement with the Centers for Disease Control and Prevention (Grant # 5 NU38 OT000167), the Practice Improvement Network (PIN) of the American Academy of Pediatrics is recruiting up to nine (9) pediatric practices for a quality improvement project focused on supporting practices to dig deeper into their clinic processes to implement strategies to support the earlier identification and diagnosis of children with intellectual disabilities and global developmental delays. 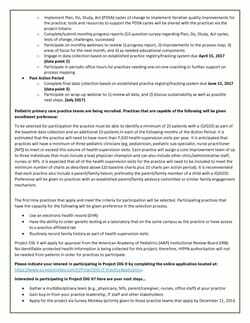 Visit the PIN Project website for an informational webinar recording, recruitment flyer and a link to the practice team application. 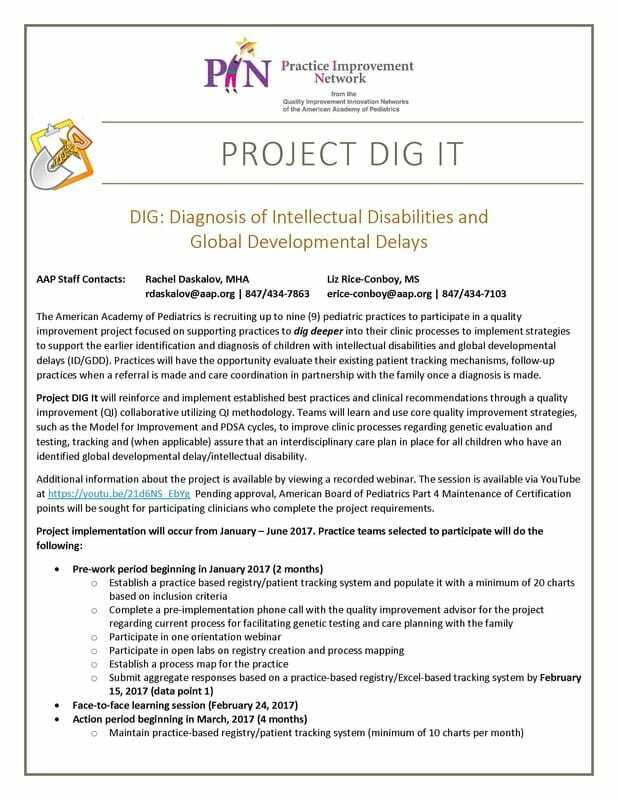 Project DIG It will reinforce and implement established best practices and clinical recommendations through a quality improvement collaborative utilizing Quality Improvement (QI) methodology. Part 4 Maintenance of Certification credit will be sought for participating practices who complete the minimum criteria for participation. Implement Plan, Do, Study, Act (PDSA) cycles of change to implement iterative quality improvements for the practice; tools and resources to support the PDSA cycles will be shared with the practices via the project listserv. The goal of this quality improvement project is to use quality improvement strategies, such as the Model for Improvement and PDSA cycles, to improve clinic processes regarding genetic evaluation and testing, tracking and (when applicable) assure that an interdisciplinary care plan in place for all children who have an identified global developmental delay/intellectual disability. The attached document includes additional information about the project and specific details regarding how to obtain and complete the project application. The first nine practices that apply by January 6, 2017 and meet the criteria for participation will be selected. Participating practices that have the capacity for the following will be given preference in the selection process. The Division of Innovation at the AAP is currently working on an exciting learning collaborative project addressing care for children and youth with endocrinology needs using Project ECHO (a model of health care delivery and education using technology). Project ECHO links expert specialist teams at an academic hub with primary care clinicians in local communities, a ‘hub and spoke’ model, via technology. The hub, GA AAP Chapter, will be entering phase II of the project. They would like to recruit primary care providers nationally who are interested in expanding their scope of practice, specific to pediatric growth and endocrinology. We would greatly appreciate it if you could promote the project on their behalf. Can you please consider sending the following information to your email distribution list as well as upcoming communication forums. Join your colleagues in learning more about pediatric growth & endocrinology by enrolling in an innovative telementoring model of health care education. This model, Extension for Community Healthcare Outcomes (ECHO), is an evidence-based model to expand primary care capacity to deliver state-of-the-art care for common, chronic diseases in vulnerable, underserved communities. The Georgia AAP Chapter in collaboration with Navicent Health Children’s Hospital, uses case-based learning sessions delivered via videoconferencing technology to bring together subspecialists at academic medical centers and community-based providers. Each Pediatric Growth and Endocrinology ECHO clinic includes a brief presentation by a pediatric endocrinologist, followed by case-based presentations by community clinicians for feedback and recommendations.